Writing music, like writing anything else, is a process. Where full studio recording sessions are like meticulously edited novels, smartphone recordings are more akin to rough sketches—a quick and easy way to capture your melodic musings. On iPhone, Voice Memos was the default first-party option for capturing audio—music or otherwise. Until today. Now Apple is launching Music Memos a more fully featured tool specifically geared toward the music-minded person on the go. From its home screen, the app works much like Voice Memos with a big, Hal 9000-like button staring at your face. Give it a tap, and you’re ready to go. At its most simple, the app can help keep your instrument tuned. But that’s just the beginning. The app also comes with a virtual drummer and bass player so you can fill out that lonesome guitar track, and a rudimentary editor so you can cut out mistakes. 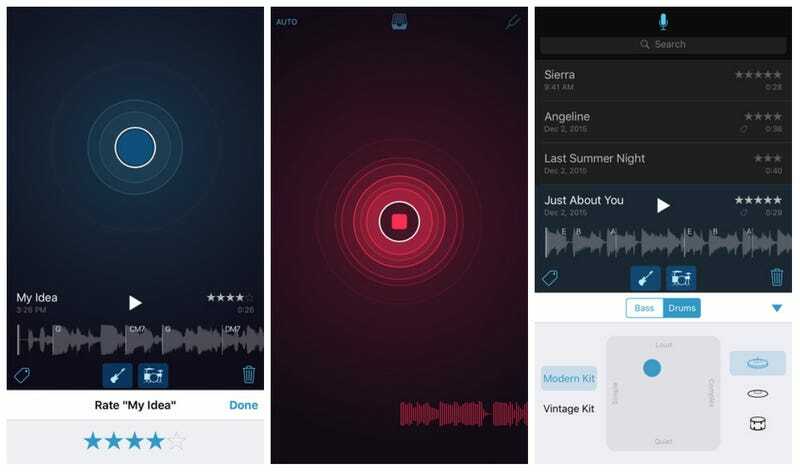 The app’s most convenient feature may be its “auto” setting, which starts recording whenever it hears music and stops when it thinks a song’s ended. Basically, plop down your phone and play, Music Memos takes it from there. Music Memos obviously integrates with GarageBand, which has its own collection of updates today, including a new Live Loop feature for EDM musicians. You can also save all your Music Memos creations to iCloud so they’re synced across all your iDevices. You can download Music Memos for free right now, and hop straight to the music making.